I loved the style, quality and color. The set was very well made and looks very stylish. I couldn't be more pleased with the new and updated look it gives my bedroom and the price was right too! The foliage themed stitching adds to its elegance. Give your bed a new, matching look with this three-piece quilted coverlet set. Made from soft and comfortable microfiber, this set includes a coverlet and two pillowcases with wireless thermal pressing to keep the filling from bunching or shifting. The set comes in your choice of blue, grey, green, or lavender colors, king or queen sizes, and can be machine washed for convenient cleaning. Please note: Some options listed or pictured may be currently out of stock. See option drop down for all in-stock options. Dimensions 18.0 In. X 16.0 In. X 5.0 In. I received my bedspread today and was pleased with the soft material and great pattern. I was surprised by the brightness of the color though. I was anticipating a much softer shade of Tiffany Blue based on the picture. However, it does still look nice in my room and matches the paint on my walls well. I am accenting with a lot of white so it makes for a refreshing and beautiful look. Also, the finished size is 118" by 106" a 2" difference from what they state. I have a deep mattress but due to the versatile pattern and not needing it to wrap around the pillows I was able to turn it the other way and have it be the perfect length on the sides and end. Had I used it the way it was intended it would not have reached the rail on both sides of the bed. Just perfect for my needs. The color is more vivid then in the pictures and it fits my high king size bed. I live in Florida so don’t need a heavy spread, this one is lightweight and soft. Haven’t washed it yet and actually ordered a skirt in case it shrinks up some. I love that it has the look of quilting but no threads that my pup can loosen and pull. Really nice! Love the material, color and pattern! The set gives the bed a nice finished look and the size is perfect for my king size platform bed. I liked this coverlet set very much. Nice weight and lovely mint color of green. Unfortunately this shade of green was too light for our use as it did not go with the rest of our bedroom decor. So I will be returning it. Nice light weight coverlet. The pattern is beautiful and the weight of it is ideal for me. Bought it in Grey for our king size bed and it fits perfectly and I love the look. Ordered this in full-queen, Tiffany blue. Color is great! Love the fit. Perfect Florida coverlet. Color as shown. Love it! I bought this in lavender. Its a nice soft color. 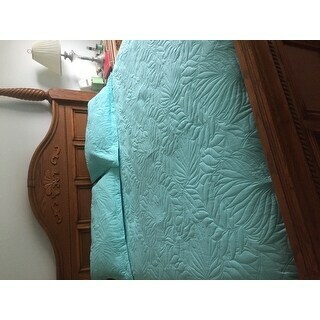 It is larger than most king quilts, comforters, etc., but was exactly what I was looking for. This coverlet is beautiful. It's very soft and light. You'll love it! Oh gosh! This thing is heavy! But loving it! It’s actually embossed. Not threaded which is better. Like the weight for Florida but shifts too easily causing the spread to fall uneven a lot of the time. The only coverlet I have found in stores and on line that is big enough to fit my high mattress and bed. Like this pattern very much....looks tropical which is just what I wanted. Big enough for any large bed for sure....really big on my king. Beautiful color and quilting. Definitely purchase again. Good quality. I ordered it in gray. Very nice. Love it. Perfect fit for our king size bed. Would definitely recommend. Just because you return something doesn't necessarily mean its bad. Personally, I thought it was a nice bedspread. It's not heavy like a lot of spreads, fit nicely, with a great color and pattern. The fact is this, when there are two people involved, husband and wife...well...let me rephrase..."wife & husband," you know who will win the battle, just say'n...The spread goes back! Yes dear, and your welcome, dinner is cooked and life is good! After 49 years you learn your lesson and who really runs the show! The only reason I give this spread four (4) stars is the fact I had to return at my expense, hey, I got'a poke somebody!? None of this would be possible without the help of the nice folks at my local UPS store, what a great bunch, I should have invested heavily in UPS...When I go in it's "hey Mr. Tom and how's the wife," what you got today, *** , Overstock, *** ..You're in trouble when they all know your name! Oh...I'm also tight with my Postman and *** and I swear, I'm not making this up, my UPS delivery guy lives around the corner! Really! So guys, just remember those magic words "yes dear, anything you say dear," your life will be stress free! Trust me and my 49 years experience! Ahhh...Fried Chicken tonight! I love the color and the color matched the online image. The weight is not too bulky or heavy. Makes it easier to make the bed each day. It has a very pretty quilted looking design. Color looks nothing like the picture. "It says there is a blue (in king size) and a Tiffany Blue (in Queen), but I don't see the aqua color that is the first picture on the left. What is that color called?" "does it shrink after washing"
"Notice king is not in grey but you show king/queen in grey so what size is king/queen?" "One of the color options is listed as "beige", but the color actually looks "ivory". Which is the correct shade?" The coverlet is not reversible. "The picture hanging above the bed in the picture, is it available through Overstock?" Unfortunately, we do not currently carry that item. "The blue color - is it a baby blue or closer to an aqua? The picture makes it look like it has a little green in it. A little green would be good." The color is much brighter than I had anticipated. Fortunately it still is a great match for my paint color but it is not a soft muted tiffany blue. If you google Tiffany Blue color charts it is very true to that color. Its more of a bright sea foam green than blue. It brightens up the room.